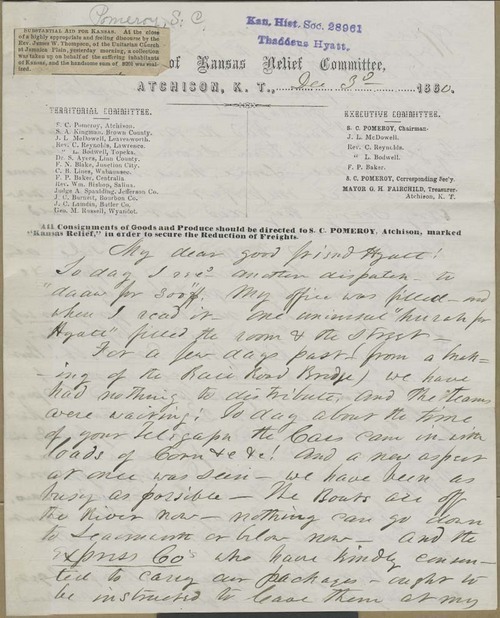 This letter was written by S. C. Pomeroy of the Kansas Relief Committee, one of several aid committees that had been formed to ease the suffering of settlers in Kansas. This particular committee specifically sought to send relief funds and provisions into Kansas during the drought of 1860. The letter is addressed to Thaddeus Hyatt, president of the National Kansas Committee, keeping him informed about the efforts to distribute food and clothing. Pomeroy appreciated the help he had received from Hyatt, but he was disappointed in Dr. Webb. The last page of the letter has been crossed out and edited.